Opal is arguably the most unique, diverse, and beautiful birthstone. Unlike most gemstones, opal is amorphous which means it does not have a defined crystalline structure. It takes on many shapes and colors and in that way, it is pretty unpredictable. Opals are very interesting and there are some myths that you'll want to know about as well. We even have some spectacular specimens for you to admire as you learn about this fascinating gemstone. Opals have been the muse of artists, writers, and other creatives since what seems like the beginning of time. The exact origin of opal's name is disputed, but historians are confident that in ancient Rome opal was known as opalus which translates as the "precious stone." Was the opal the ancient Romans admired the same as the one we admire today? No one is sure. 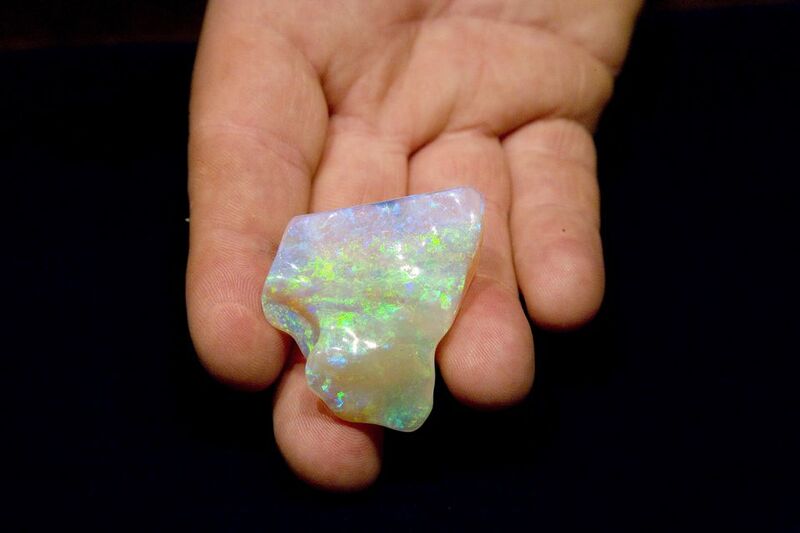 However, evidence of opal artifacts date as far back as 4000 B.C. Not only has opal been in the minds and hearts of mankind for hundreds, if not thousands, of years, opals take a very long time to form. According to popular theory, silica (which is what opal is made out of) flooded parts of Australia 20 to 30 million years ago. As millions of years passed, this silica solidified between boulders and crevices to form opal. This didn't happen overnight! It takes roughly 5 million years to solidify just one centimeter of opal. Though the exact cause of opal formation is still disputed, many believe that silica was carried down into rock crevices by heavy rains. Once the water evaporated, what was left was a silica gel that then hardened over the course of what some believe is millions of years. This theory makes sense considering opal has water in it. The water content of an opal can be upwards of 20 percent but is usually in the 5 percent range. It is estimated that nearly 95 percent of the world's opal comes from Australia. Other countries that commonly mine opals include Ethiopia, Brazil, and Mexico. There are two types of opals: precious and common. Precious opals either have vibrant color (fire opal) or exhibit a play of colour. Play of colour is a term coined to describe the unique multidimensional color display that the more precious opals have. Precious opals have two basic colors, their background color and their play of colour. The background color is caused by impurities within the silica. The other colors are caused by the way silica forms together. Silica is composed of a bunch of tiny spheres that adhere to one another. When they fuse, tiny gaps are created between them that allow the light to diffract. This diffraction causes a magnitude of different shapes and color combinations. Within the precious opal family, there are many different varieties of opal. Each has their own unique color combinations and character traits. Opals can be found orange, yellow, red, green, blue, or purple. Black opals are considered one of the rarest gemstones, though they too can be a variety of dark colors. Boulder opal is the only opal that can display the entire rainbow within one stone. That's at least seven colors if you count indigo. Unlike many other gemstones on the market, opals are usually left in their natural state. However, some common treatments include fracture filling and smoke treatment, which is used to darken the stone. Opals that have the most intense and diverse play of colour are generally the most expensive and prized. "Opals have been synthesized since the 1970s. Natural opals have also been sliced and adhered to onyx and other gem material to give the illusion of a bigger, dark, more expensive opal. The "doublets" are more susceptible to harm if they are submerged in liquids for long periods of time. Opals rank 5.5 to 6.5 out of 10 on Mohs Scale of Hardness. They are certainly more fragile than the other birthstones, so you do need to be careful with them. However, with proper care, they should hold up well. Opal became the official birthstone of the month of October in 1912. The National Association of Jewelers came together at that time to finalize the longtime debate as to which gemstones represented each month. Opal has been a clear winner for the month of October since the 15th century. Not only is there a birthstone from every month, there are Zodiac birthstones as well. The birthstones that apply to your Zodiac sign are not as defined as the monthly birthstones that were cemented by the National Association of Jewelers. Many cultures throughout history have associated different gemstones with astrological signs. The stone that aligns with your sign largely depends on which list or culture you choose to follow. Opal has commonly been associated with the signs Scorpio and Libra, which aligns with October. Opal is the official gemstone gift alternative for the 14th wedding anniversary. Many people believe that wearing an opal if it is not your birthstone or buying an opal for yourself is bad luck. There are many stories of opals getting lost or destroyed and the owner blaming the occurrence on this superstition. One reason the superstition may have developed is due to the fact that opals are a softer stone and more susceptible to damage. Petrified wood or "fossil wood" has the same makeup as an opal: amorphous silica. However, not all petrified wood is considered opal. Sometimes, however, the fossil can be overtaken with an opal-like sheen or be replaced with opal entirely.